Still, the Chromebook x2 is a very interesting piece of hardware, and not just because it's the first of its kind to run Chrome OS. For one, unlike many detachables, the x2's backlit keyboard dock uses a self-supporting hinge - no kickstand or flap business necessary. If you remember ASUS's old Transformer Pads, the mechanism (which is on the keyboard) is kind of like that. You can also dock the tablet in the hinge backward and fold it back to effectively make it a convertible, like Microsoft's Surface Book. It's a significant benefit for people who actually want to use this thing first and foremost as a laptop. 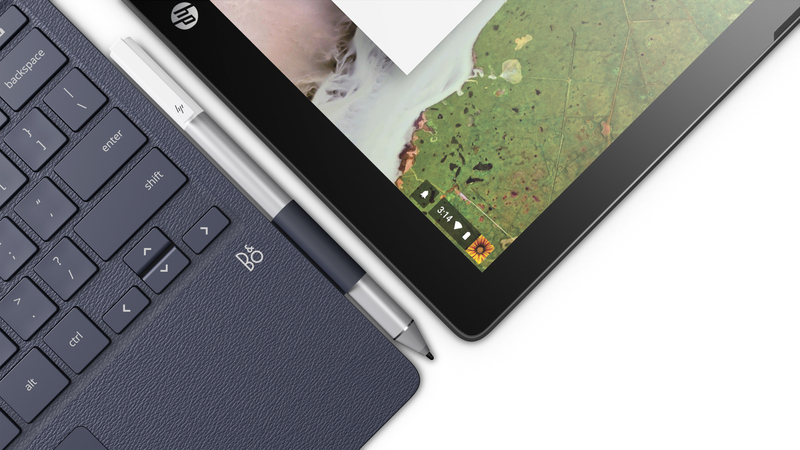 It also comes with a stylus (of the ASE variety) in the box - HP isn't selling it as an add-on, so it clearly believes people are going to be using pen input on this device. Having used my Pixelbook's pen, I can say I really... don't think people will. A stylus on Chrome OS just isn't that useful at this point, and without some more robust integration in popular applications, I don't see that changing. Hell, Google freakin' Docs doesn't support stylus input. 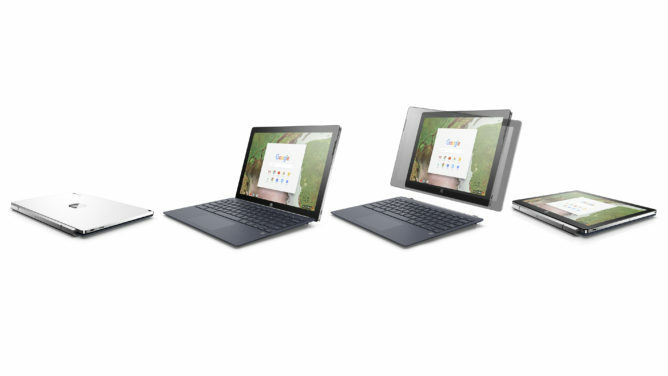 How am I supposed to believe Google is taking pen input in the OS seriously when its own products don't? Anyway, that's a rant. Did I mention the x2 has front and rear cameras? I guess that's a plus - it could be useful if you want to use your rear camera to snap a picture of a document to mark up, for example. Just not in Google Docs. Moving on, the x2's 12.3" QHD 4:3 display offers 2400x1600 pixels of resolution, and the whole fanless tablet (minus keyboard) weighs in at a little over 1.6 pounds, just a hair lighter than the current-generation Surface Pro, and a few hairs slimmer, at 8.2mm thick. The base model offers 4GB of RAM and a dual-core Core m3 (7Y30) processor with turbo speeds up to 2.6GHz. This is the same processor used in the base model 2017 Surface Pro, and it's pretty powerful. While the "m3" name may put off some, it is nearly identical to the Core i5 in Google's Pixelbook in all regards but max clock speed and a few obscure, chipset-level features, so the x2 should be a pretty fast little machine. The 48Wh battery provides around 10.5 hours of usage according to HP, which is believable for a Chromebook, and it charges via a 45W USB-C adapter. 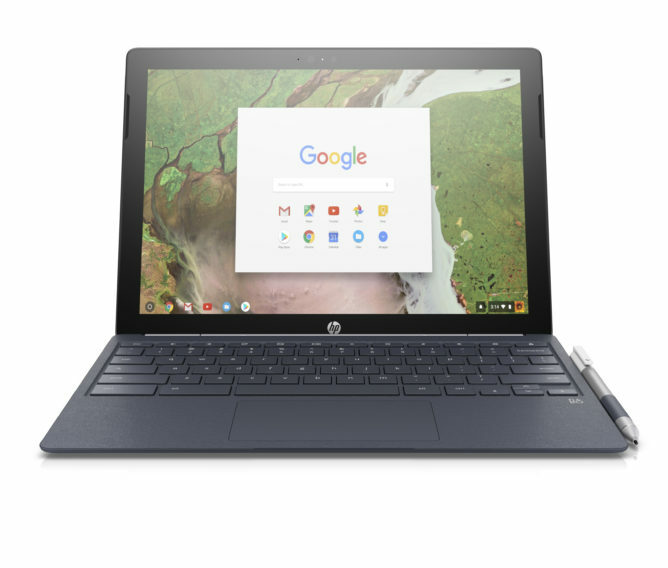 It also appears there will be an 8GB model, but HP wasn't providing any details on the pricing, release date, processor, or any other differences between the SKUs. However, we do know the 4GB model goes on sale June 10th, for the previously-mentioned $599.